Fresh from record-breaking opening of The Mummy as the biggest worldwide debut weekend of his legendary career, Tom Cruise will soon be seen in the big screen this year in Universal Pictures' new action thriller, American Made. Take a look at the film's teaser poster here and watch American Made in Philippine cinemas on Sept. 13, 2017. 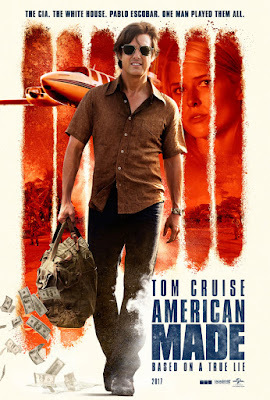 In American Made, Tom Cruise reunites with his Edge of Tomorrow director, Doug Liman, in this international escapade based on the outrageous (and real) exploits of Barry Seal, a hustler and pilot unexpectedly recruited by the CIA to run one of the biggest covert operations in U.S. history. The film also stars Domhnall Gleeson, Sarah Wright, E. Roger Mitchell, Jesse Plemons, Lola Kirke, Alejandro Edda, Benito Martinez, Caleb Landry Jones and Jayma Mays. American Made is produced by Imagine Entertainment’s Academy Award®-winning producer Brian Grazer (A Beautiful Mind), Cross Creek Pictures’ Brian Oliver (Black Swan) and Tyler Thompson (Everest), Quadrant Pictures’ Doug Davison (The Departed), and Kim Roth (Inside Man). American Made is distributed in the Philippines by United International Pictures through Columbia Pictures.